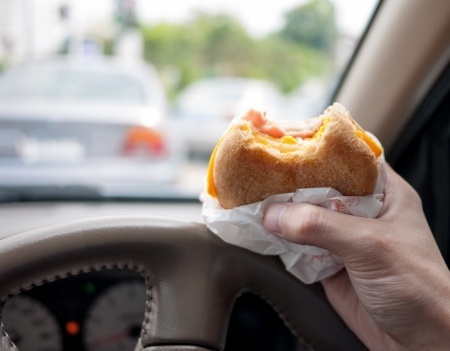 If eating is allowed in the car, make sure it is of the non-sticky, nonstaining food variety. Should kids be allowed to eat on the road? Different parents have differing tolerance levels. Different parents also have differing views and criteria. Yes, it's best if kids don't eat on the road - for the car's interior, their clothes, and our nerves. Here are a few ideas to consider as you decide the right answer for your situation when it comes to dashboard dining. It's hard to say no to eating in the car on the road when you have a 500-mile road trip ahead. You'll give the little one anything that will keep him quiet part of the way. But as kids get older and easier to shush, some parents start getting strict about eating on the road. It doesn't matter which way you go, just stick with it. Consider these rules of the road if food is allowed: It has to be of the non-sticky, nonstaining food group. No chocolate (however if someone forgets this rule, read how to get chocolate stains out of upholstery), no grape juice, nothing difficult to clean up. Vacuum the car interior weekly. If you're eating on the road, this is a must. If you don't let the kids eat at the dashboard diner, you can probably get away with vacuuming monthly. Clean up spills immediately, using upholstery or carpet cleaner for carpets and fabric seats. My baby wipes came in handy when those spills happened on the plastic console between the seats. Each week - or at least once a month - clean the dashboard and doors with a damp cloth or the old standby, baby wipes. Use a damp brush for vents and hard-to-reach spots. Apply a vinyl cleaner and restorer to finish the job. Clean Home › The Family Car › Dashboard Dining: Yes or No?